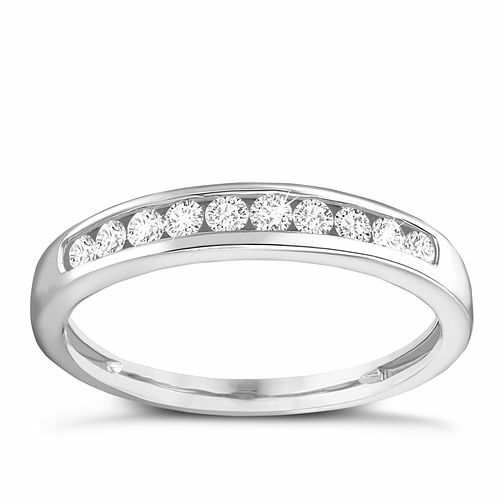 An elegant 9ct white gold ring adorned with channel set round diamonds totalling 1/4ct. A beautiful ring with a unique twist, perfect as a gift for a loved one on your anniversary, or merely as a declaration of your commitment. 9ct white gold 1/4ct diamond channel set eternity ring is rated 5.0 out of 5 by 2. Rated 5 out of 5 by Anonymous from stunning comliments my diamond solitaire bought this ring to match my diamond twist solitare didn't want a thick band as I have small fingers this ring compliments it and sparkles nicely! very happy with my purchase!